NOTICE: Closed on July 14, 1985. Now serves as a training center for Thoroughbred racehorses. 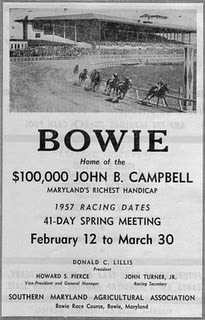 The Bowie Race Track was a horse racing track located in Bowie, Maryland. Opened October 1, 1914 by the Southern Maryland Agricultural Society, the racetrack was a major attraction in the area, serving the now defunct WB&A Railroad that drew passengers from New York, Philadelphia and points along the way. The track was a natural addition to the area, home to the Belair Stud Farm, founded by Samuel Ogle and credited as the "Cradle of American thoroughbred racing." During the night of January 31, 1966 a fire burned down five barns at the track that took the lives of at least 43 horses. Competition from new racing operations such as Keystone Racetrack in Bensalem, Pennsylvania ultimately led to the demise of the Bowie Race Track which ceased racing operations on July 14, 1985. The track now serves as a training center for Thoroughbred racehorses.